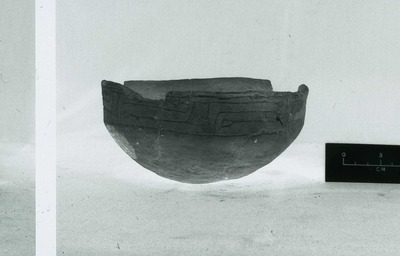 "41HS3, 759, Burial A-58" by Timothy K. Perttula and Robert Z. Selden Jr.
DECORATION (INCLUDING MOTIF AND ELEMENTS WHEN APPARENT): The interior and exterior vessel surfaces have a red slip. The rim panel has four sets of horizontal-vertical engraved scrolls divided by vertical columns with the SZ element. Extending out horizontally from the top and bottom of the SZ column are single horizontal engraved lines that end in open triangle elements. Ripley Engraved, var. unspecified carinated bowl (No. 759) in Burial A-58 at the H. R. Taylor site.